Perhaps no Freemason who ever lived in America has been so condemned by some authors and praised by others as Joseph Brant, the powerful and influential Mohawk chief who sided with the British during the American Revolutionary War. On several occasions, he put into practice the Masonic virtues of brotherly love, forgiveness, and charity. On others, he exhibited cold-blooded ruthlessness, savagery and disregard for human life. Unfortunately, space does not permit a lengthy discussion of the life or exploits of this remarkable and complex native American. For a full biography, Reference is the standard source. The parents of Joseph Brant were Mohawks whose home was at Canajoharie on the Mohawk River in New York. Brant, however, was born on the banks of the Ohio River in 1742 while his parents were on a hunting excursion to that region, and was given the Indian name of Thayendanega, meaning "he places two bets". His father was Nickus (or "Nicholas") of the Wolfe family, who, although not a chief, was a Mohawk of some standing in the tribe. Dr. David Faux's study of the Fort Hunter Church records indicates that his father's name may have been Peter Tehonwaghkwangearahkwa, who would have died before 1753. Other sources cite the father's name as Nickus Kanagaradankwa. His mother Margaret, or Owandah, the niece of Tiaogeara, a Caughnawaga sachem, took Joseph and his older sister Mary (known as Molly) to Canajoharie, on the Mohawk River in east-central New York, where she had lived before her family moved to the Ohio River. His mother remarried on 9 September 1753 in Fort Hunter (Church of England) a widower named Brant Canagaraduncka, who was a sachem of the tribe. Her new husband's grandfather was Sagayendwarahton, or "Old Smoke," who visited England in 1710. While this bettered his mother's fortunes, it conferred little status on her children, as Mohawk titles descended through the female line. While still in his early youth, Brant became a favorite of Sir William Johnson, the British superintendent of the northern Indians of America, who was extremely popular with the tribes under his supervision. During his time with the Iroquois, Johnson became particularly close to the Mohawk tribes. He was also a Mason and a former Provincial Grand Master of the New York colony. After Johnsons European wife Catherine died in 1759, he married his former Indian mistress, Molly, who was Brants sister, in an Indian ceremony later that year. It was due largely to Johnsons relationship with Molly that Brant received the favor and protection of Sir William and through him the British government, which set Brant on the road to promotion. Brant and a number of young Mohawks were selected by Johnson to attend Moors Charity School for Indians at Lebanon, Connecticut--the school which in future years was to become Dartmouth College. Here he learned to speak and write English and studied Western history and literature. He is the only one of those chosen known to have derived any benefit from the educational process. He left school to serve under Sir William from 1755-1759 during the French and Indian War (1754-1763). After this, he became Sir William's close companion and helped him run the Indian Department, administered by the British out of Quebec. He also became an interpreter for an Anglican missionary and helped translate the prayer book and Gospel of Mark into the Mohawk language. About 1768 he married Christine, the daughter of an Oneida chief, whom he had met in school. Together, they settled on a farm near Canajoharie which Joseph had inherited. While here, Brant assisted in revising the Mohawk prayer book and translating the Acts of the Apostles into the Mohawk language. He also joined the Anglican Church, was a regular communicant, and evinced a great desire to bring Christianity to his people. His wife died of tuberculosis about 1771, leaving him with a son and a daughter. In 1773, he married his wife'ss sister, Susannah, who died a few months afterward, also of tuberculosis. In 1774, Sir William Johnson died and was succeeded in his territories by his son Sir John Johnson, and as Superintendent of the Indian Department by his son-in-law, Col. Guy Johnson, both of whom were Masons. The Johnsons, together with Brant and the Tory leaders Col. John Butler and Col. Walter Butler (also both Masons) were to become leaders of the Loyalist resistance and terrorism in Northwest New York. Those who remained loyal to England, known as "Loyalists" or "Tories", were not all colonists. Other allies of the British were numerous Indian tribes, more especially the Iroquois tribes who occupied the lands from upstate New York south to northern Pennsylvania with scatterings further south and north and extending west to the Great Lakes. The Iroquois League, also known as the Six Nations, was a confederation of upper New York state Indian tribes composed of the Mohawks, Onondagas, Cayugas, Senecas, Oneidas, and Tuscaroras. They lived in comfortable homes, often better than those of the colonists, raised crops, and sent hunters to Ohio to supply meat for those living back in New York. In August, 1775, the Six Nations staged a big council fire near Albany , after news of Bunker Hill had made war seem imminent. After much debate, they decided that such a war was a private affair between the British and the colonists, and that they should stay out of it. Brant feared that the Indians would lose their lands if the colonists achieved independence. The Johnsons and Brant used all their influence to engage the Indians to fight for the British cause, and ultimately succeeded in bringing four of these tribes, the Mohawks, Onondagas, Cayugas, and Senecas into an alliance with England -- the Oneidas and Tuscaroras ultimately sided with the Colonists. About the year 1776, Brant became the principal war chief of the confederacy of the Six Nations, due perhaps to the patronage of the Johnsons and the unusual circumstances in which he was placed. With this high office of leadership, he also received a Captains commission in the British army in charge of the Indian forces loyal to the Crown. Immediately after receiving this appointment, Brant made his first voyage to England. By making this trip, he gained time, and was enabled to observe for himself the power and resources of the King and British government. He also went to protest the policy of Guy Carleton, commander of the British forces in Canada, who refused to invite the Six Nations to join the war against the Americans, except to use 40 to 50 men as scouts. Brant was well received in England, and was admitted to the best society. His own education and his close association with educated men and his naturally easy and graceful manner facilitated his reception, and as he was an "Indian King" he was too valuable a person to be neglected. The members of the British cabinet and the nobility fawned over him; gave him expensive presents; invited him to their great estates, and arranged to have his portrait painted by famous artists like Reynolds, Romney, and others. Among his particular friends was the English diarist Boswell. He received official assurances that the Indian Loyalists would be utilized to a greater extent in the American conflict than that indicated by Carleton. Also during this trip Brant received the Masonic degrees in either Falcon Lodge or Hirams Cliftonian Lodge in London in April 1776. He had the distinction of having his Masonic apron given to him from the hand of King George III. Brant returned from England in time to see some action in the Battle of Long Island in August 1776. He then departed for his homeland, traveling by night to elude the Americans guarding the Hudson highlands and the area around Albany. He told the young Iroquois braves of his trip to England and of the strength and friendship of the British. He denounced the Iroquois 1775 decision to remain neutral and called the Americans the enemy of all Indians. A tradition says that he promised each of his warriors an opportunity "to feast on a Bostonian and to drink his blood". The speech was received with wild enthusiasm and Brant departed on a tour of regional Iroquois villages to similarly stir up support for the British cause. 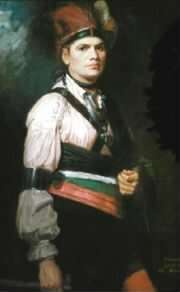 Space in the present article does not permit a detailed discussion of the many battles in which Chief Joseph Brant played an indirect or a direct part. For a description of these, the references listed contain some excellent material. Suffice it to say that his name has been linked with some of the most notable and infamous engagements of the Revolutionary War--the siege of Ft. Stanwix; Oriskany; the Wyoming Valley of the Upper Susquehanna; Mohawk Valley and German Flats; Cherry Valley; Minesink-Port Jervis; Chemung River-Elmira area; Johnstown; Fort Plain; Fort Clyde; Fort Plank; Mohawk Valley and the Western Frontier, all of which occurred during the six year period from 1775-1781. We now turn to two incidents which are often cited by Masonic writers in reference to Brants association with Freemasonry--his saving the life of Capt. John McKinstry and his attempt to save the life of Lt. Boyd. After the surrender of the American forces at the Battle of the Cedars on the St. Lawrence River in 1776, Brant exerted himself to prevent the massacre of the prisoners. In particular, one Capt. John McKinstry, a member of Hudson Lodge No.13 of New York, was about to be burned at the stake. McKinstry, remembering that Brant was a Freemason, gave to him the Masonic sign of appeal which secured his release and subsequent good treatment. He and Brant thereafter remained friends for life, and in 1805 he and Brant together visited the Masonic Lodge in Hudson, New York, where Brant was well received and on whose wall his portrait now hangs. The American general Sullivan, also a Freemason, ambushed the Indians and Loyalists at Newtown, New York in 1779, resulting in the flight of the Indians and a march across the state by Sullivan to the Genesee Valley, destroying the Indian villages and the power of the Indian confederacy. During this campaign, a certain Lt. Boyd, a young Freemason and scout for Sullivan, was ambushed and captured along with a soldier named Parker. In the words of John Salmon, who was a friend and fellow-soldier of Boyd, the incident continued as follows: "...When Lieut. Boyd found himself a prisoner, he solicited an interview with Brant, whom he well knew commanded the Indians. This chief, who was at that moment near, immediately presented himself, when Lieut. Boyd, by one of those appeals which are known only by those who have been initiated and instructed in certain mysteries, and which never fails to bring succour to a distressed brother, addressed him as the only source from which he could expect a respite from cruel punishment or death. The appeal was recognized, and Brant immediately, and in the strongest language, assured him that his life should be spared. "Lieut. Boyd and his fellow-prisoner Parker were immediately conducted by a party of Indians to the Indian village called Beards Town, Brant, their generous preserver, being called on service which required a few hours absence, left them in the care of the British Colonel Butler of the Rangerswho as soon as Brant had left them, Butler commenced an interrogation to obtain from the prisoners a statement of the number, situation, and intentions of the army under Gen. Sullivan...."
Another authority continues: "...Butler ordered Boyd placed kneeling before him, with an Indian on each side, one holding his arms, and another with a tomahawk raised over his head. Butler then three times asked of Boyd information which his loyalty to his commander would not permit him to give. Boyd, he said, Life is sweet, you had better answer me. Duty forbids, was Boyds reply, I would not if my life depended upon the word. Boyd three times refused and Butler delivered him to the infuriated Indians who put him and Parker to death with terrible torture, he remaining faithful to the last to his trust, (and) forfeited his life rather than yield up his integrity." Returning to Salmons account. " ... The bodies of Lieut. Boyd and Private Parker (who were killed by decapitation--author) were found and buried near the banks of Beards Creek, under a bunch of wild plum-trees....I was one of those who committed to the earth the remains of my friend and companion in arms the gallant Boyd....The foregoing account, according to the best of my recollection, is strictly correct." Thus it would seem that Brant, the "savage", was more charitable in his actions toward his patriot Brothers than were the British Tory Freemasons with whom he was in league. But we should not forget that Brant had received the education of a civilized man, had read the Scriptures, and professed to be a Christian and a Freemason, and he knew that the rapine and atrocities practiced by the Indians were unjustifiable. One can only wonder why Brant did not release Boyd and Parker after he had agreed to spare them, or why he did not have greater influence and control over his Indians to prevent the execution of these unfortunates at Butlers hands. In spite of their defeat by Sullivan, the Iroquois raids persisted until the end of the war and many homesteads had to be abandoned. About 1782, Brant married for the third time to Catherine Croghan, daughter of an Irishman and a Mohawk. He discouraged further Indian warfare, but kept his commission in the British army. He was awarded a tract of 675,000 acres on the Grand River in Ontario to which he led 1,843 Mohawk and other Indian Loyalists in 1784 where they settled and established the Grand River Reservation for the Mohawk. He became affiliated with Lodge No. 11 at the Mohawk village at Grand River of which he was the first Master (presiding officer); he later affiliated as well with Barton Lodge No.10 at Hamilton, Ontario. In later years, the town of Brantford, Ontario, on the Grand River was named for him. Due to some legal difficulties with the title to the Reservation land, Brant again went to England in 1785, where he was again well received. At this time, he was able to obtain compensation for Mohawk losses in the U.S. War for Independence and received funds for the first Episcopal Church in Upper Canada, but failed to obtain firm title to the Reservation, whose legality remains in question today. On being presented to the King, he declined to bend his knee or kiss his hand, saying," I bow to no man for I am considered a prince among my own people. But I will gladly shake your hand." However, he added he would willingly kiss the hand of the Queen. Again, he sustained himself well in the best circles of the British metropolis, and became a friend and companion of the Prince of Wales. Another objective of his visit was to find out whether the Indians could rely on the support of Great Britain if a general war between the Indians and the United States should erupt. The British government declined comment on so delicate a matter, and referred him to the governor of Canada. Brant returned home to Canada in 1786. The United States government sought his aid in securing an end to the wars with the Indians in the North- west Territories newly ceded to the United States by the Treaty of Paris, and he went alone to Philadelphia in 1792 for a meeting with President Washington and his cabinet; and he claimed to have received 1000 guineas down payment, plus the offer of an ultimate reward of 20,000 pounds for arranging " a peace with the Ohio Indians". He assured the United States he would help, but upon his return home he changed his mind and actually worked to foment unrest and rebellion among the Ohio valley Indians against the Americans, traveling in the American West to promote an all-Indian confederacy to resist land cessions. Following this, he devoted the remainder of his life to the interests and moral improvement of his tribe, continuing his missionary work and translations of Bible passages into the Mohawk language. Brant constructed for himself a spacious dwelling in Canada, where he lived in handsome style with a host of slaves, as many as the aristocratic Virginians who would later rule the United States. His clothes were of the finest material, and in his luxurious home elaborate meals were served on crisp Irish linen. At home, he was a hospitable and convivial man, treating those who visited him kindly and courteously. His children were all well educated and his sons Joseph and Jacob were sent to Dartmouth. Unhappily, in 1795, his oldest son, Isaac, made a drunken assault on his father, who drew his dagger and inflicted a mortal wound. The case came before the Council of Sachems and Warriors, which exonerated Brant on the grounds of self-defense. Also, throughout his life, Brant maintained friendly relations with the English, and favored the introduction of agriculture and the useful arts among his tribe. What more, then, can be said about this remarkable individual, who was at ease drinking tea from fragile china cups, but could also hurl a tomahawk with deadly accuracy? We know that he was well educated; his compositions are highly respectable in point of thought and style, far beyond many of the farmers he had fought against. Perhaps it would have been impossible for Brant to have supported the American cause; he being too vain and too closely allied with the British Lords of the Mohawk valley to consider casting his lot with the humble farmers who spoke of freedom. For Brant, they had the stink of manure and earth about them; he was more familiar with buckled shoes and cologne. It is hard to imagine any other native American, though, who profited so greatly from the Revolutionary War. Brant died on November 24, 1807, at the age of nearly sixty-five years, at his own house on Grand River, Ontario, and was buried by the side of the Episcopal church he had built there. In 1850 Freemasons restored his tomb and placed an inscription on it, and a bronze statue of him was unveiled at Brantford in 1886. His last words, uttered to his adopted nephew, were: " Have pity on the poor Indians; if you can get any influence with the great, endeavor to do them all the good you can."